Krazy Krones 2 needs to get in the mail tomorrow. It is a birthday gift for my sister. Kerry will get her patriotic mini on Saturday. 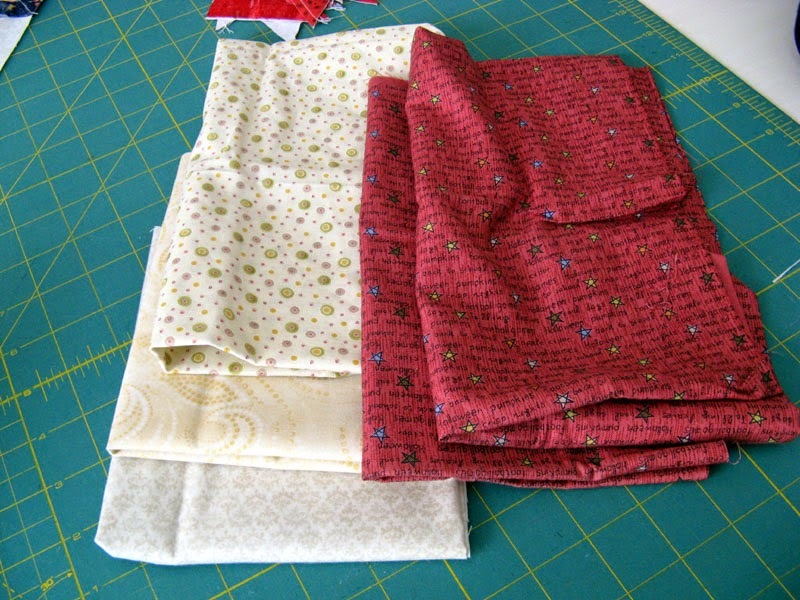 My next binding project to complete is Kerry's Orca Bay. I have several projects going on in my studio. Most of them binding. I came home from Kerry's with three of my own projects and two of hers to finish. Krazy Kattle 2 is a Buggy Barn left over blocks project that will be gifted to my Mom. Except for the barn in the upper right corner all the blocks were too much for the original project. Mom really likes the cows and soon she will own one of her own. Kadence is from a free on her website Bonnie Hunter design called Fourth of July. 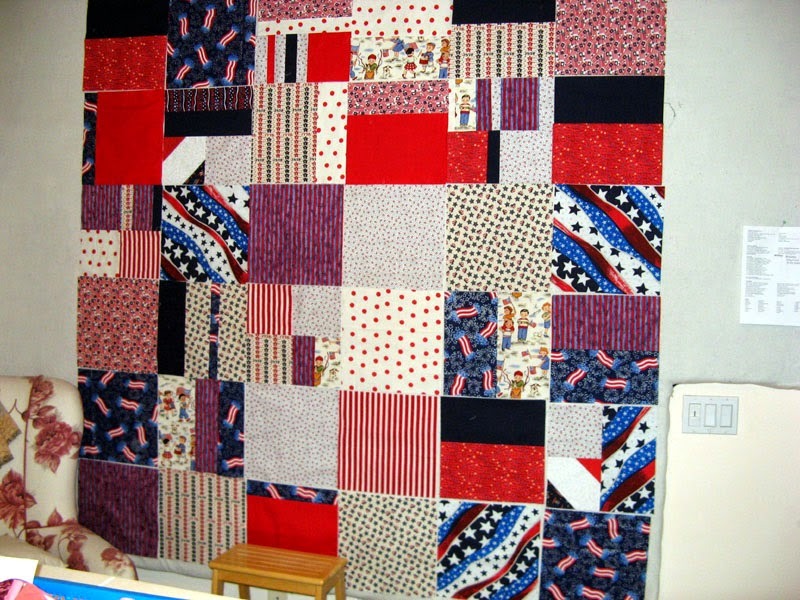 This quilt is to be donated to a Veteran. I'm thinking it will make its way to Southern Maryland. Krazy Krones 2 is also from a left over block from the original project. My Sister Karen will be the recipient of this broom stick riding witch. I'm working to have it in her hands for decoration this Halloween. Orca Bay and the Patriotic Mini are both Kerry's. I offered to help her out with some hand sewing and brought these two home to finish for her. I was able to finish the Patriotic Mini during the awesome Chargers WIN! I've started on Orca Bay and will probably have it complete for the next time we get together. As for what is on my Design Wall...it's my version of Bonnie Hunter's Zuckerwatte. I'll be needing to find more of the inner border fabric for the bias binding or just purchase enough for both. I want these two elements to match. 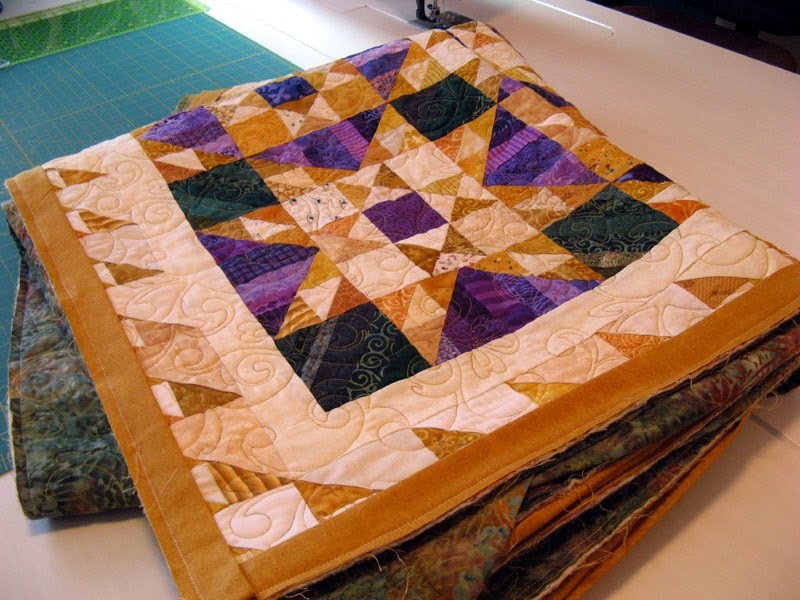 The reason for needing a bias binding, which as you know takes a little more fabric, is because once quilted the outer string border will be cut "scalloped". I'm really looking forward to my first ever "scalloped" border experience. Hope you have a wonderful week. 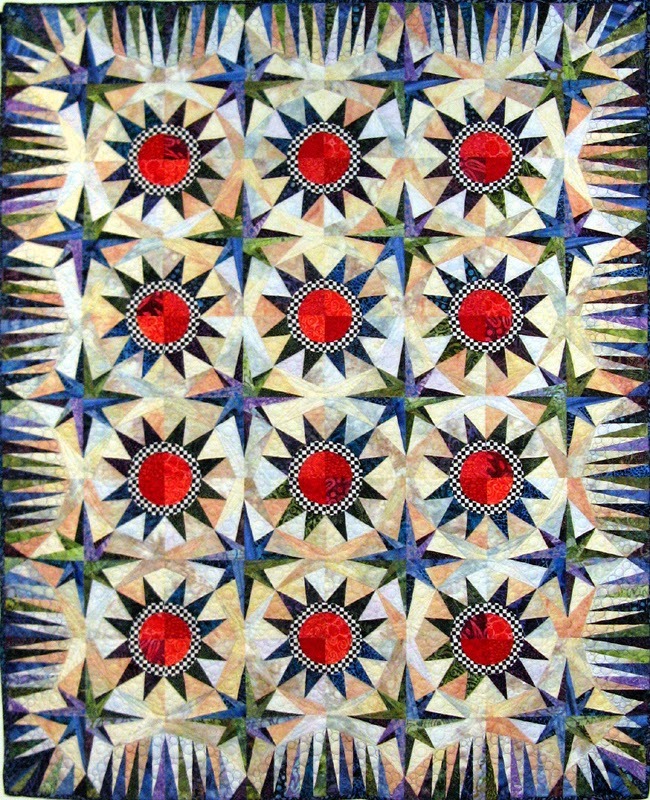 More eye candy from quilters located around the globe through the links at Patchwork Times. The days of September are nearing the end. UFO is done for the month...YIPPEE! It has even been quilted already. Today I'm working on the binding. 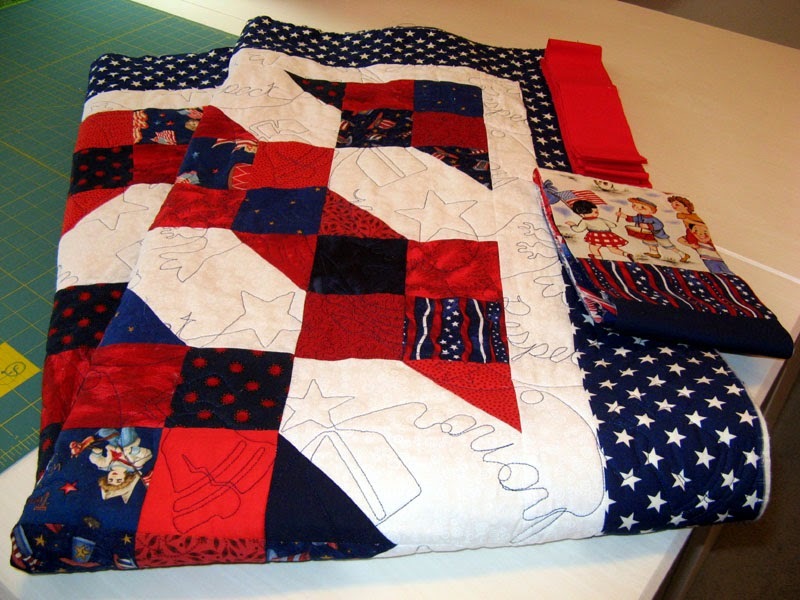 This patriotic quilt will be donated to the Veterans. 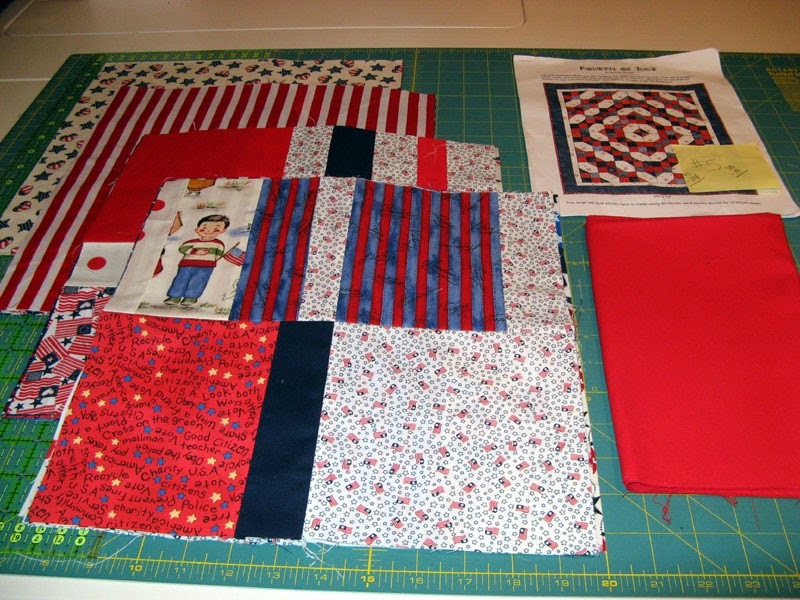 It seems just right with the pattern name "Fourth of July", the fabric selection, and the quilting design. I've been steady working on my Zuckerwatte project. I have all the blocks done and only a little bit of the string outer border to finish before I start final assembly. I had a little bit of enhancement this week on Monday when three of the five fabrics arrived from Buggy Barn's going out of business sale. I'm sure these won't stay in my stash for too long. Part of the Buggy Barn purchase was three books. There are some real cute designs that you'll be seeing in days ahead. For this week my stats for the last Sunday in September. More using their stash in fun ways through the links at Patchwork Times. Kerry at Kerry's Quilting invited me to participate in the Around the World Blog Hop started by Karen Miller of Karen's Quilts, Crows and Cardinals. In the next paragraphs I hope to share with you my "creative process". I'd hoped to link forward to a few of my blogging friends, but truth to be told everyone has something going on leaving no time to keep the "Hop" going from my end. I will however share with you links to blogs I enjoy reading. Kerry is a very dear friend. We met through Canyon Quilt Guild years ago while I was the Project Linus Chairperson. 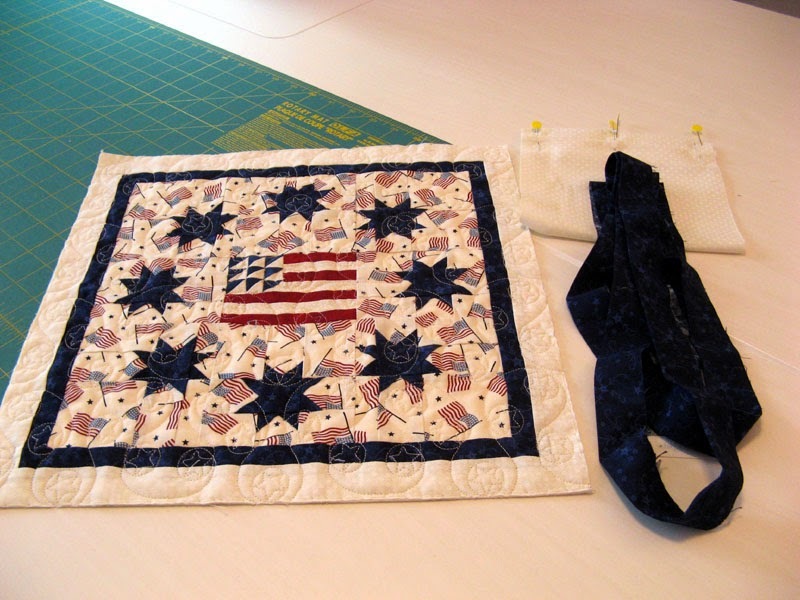 Kerry had just purchased a Gammill long arm sewing machine with a Statler Stitcher and was eager to practice. 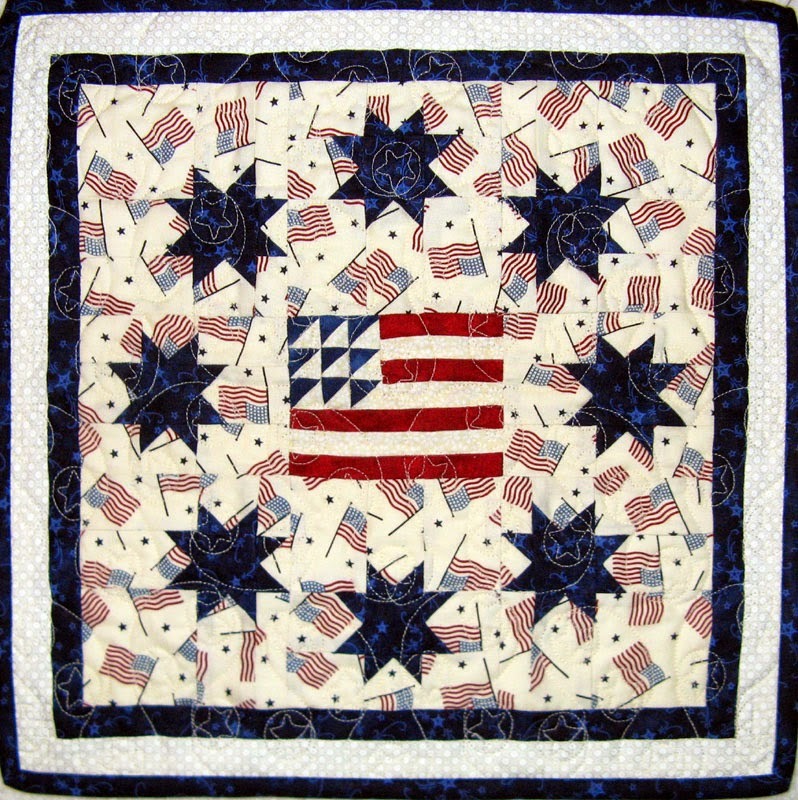 This union produced not only a very strong and enduring friendship but hundreds of charity quilts for Project Linus. We've continued on with several other charity donations that include an annual donation to the San Diego Humane Society's Fur Ball, the American Legion Auxiliary, the American Red Cross, the Veterans Association, American Cancer Society, and several disasters around the country caused by Mother Nature. We meet up as often as possible for sewing days that are mutually cherished. We've done a few projects together, share our stash, and usually take the same workshops as well as attend the same quilt shows. We've reached that type of relationship that endures time. Quilting has truly presented me with a wonderful friendship. So "What am I working on?" I'm always busy in my sewing room, nook dining table, or a TV table in my family room. If I'm not busy doing something...sleep overtakes me! I have two projects in full swing. Bird Brain by Buggy Barn and Zuckerwatte by Bonnie Hunter. After finishing my UFO for the month I work at fast pace to get new projects rolling. Honestly I don't have UFOs in the true definition. My UFOs are from patterns that I've collected and didn't start when I first learned of them. 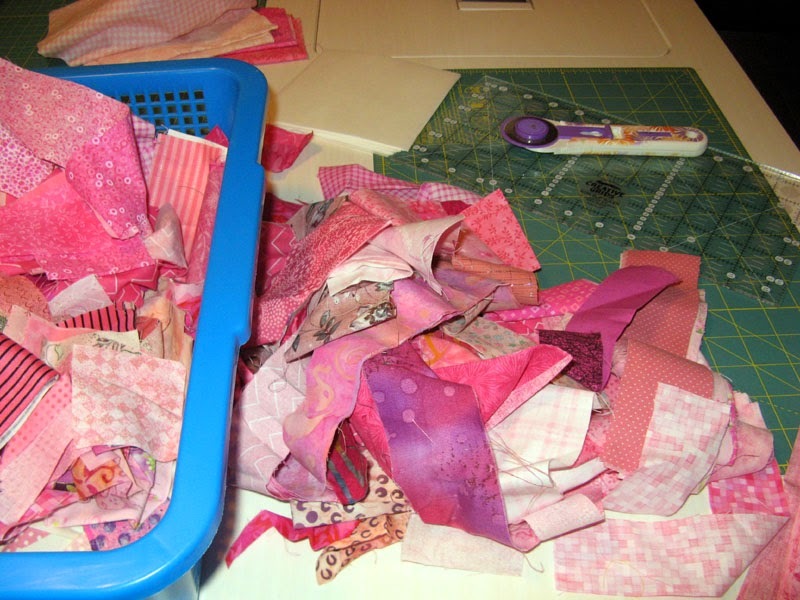 You know it's the "Quilting Bucket List" that so many of us have. I do have a couple of projects that I've been waiting to figure out a setting, but I don't see them as UFOs at this state. 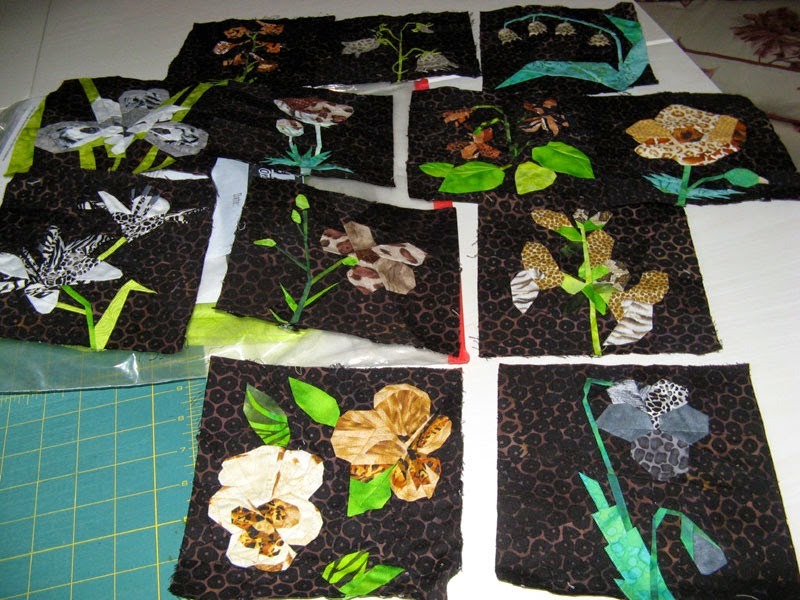 My Kourageous project was an idea UFO to make 12 blocks that were exotic flowers made with animal skin themed fabrics. 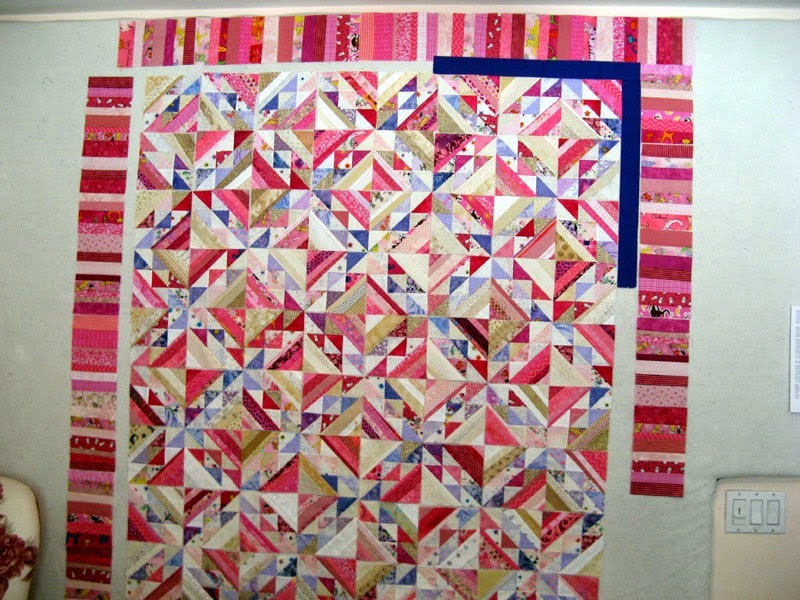 I also have a Quilt Square Quilt Along started with Jo's Country Junction in 2012 that waits for a setting. Not sure "How my work differs from others of its genre?" Except perhaps in my naming convention. Years ago I started this odd thing of using "K" in the names of my cats. Kaos and Komotion both of which are Abyssinian cats. 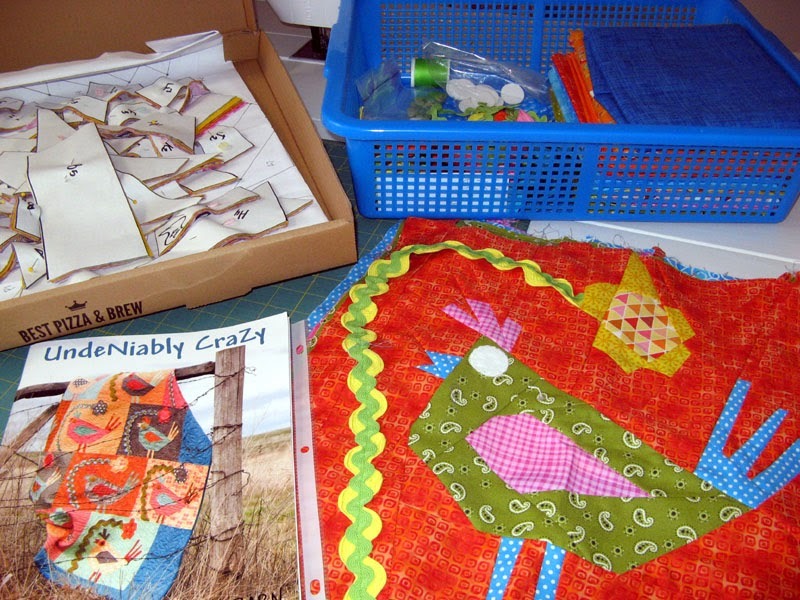 Next my Dad helped me name my website after my two loves Quilts and Cats or kwiltnkats. 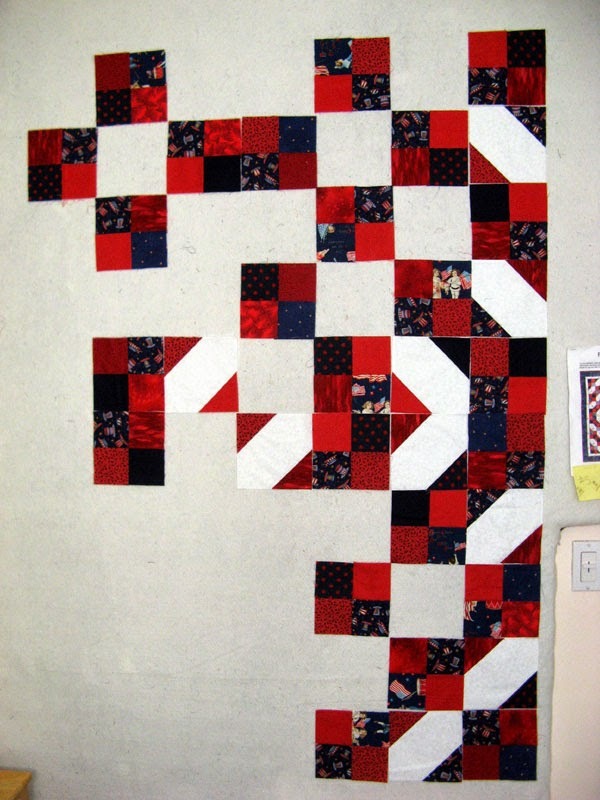 In keeping with that my blog and next, each and every quilt or project name starts with a "K". This certainly at times can be a challenge that my family, friends and blog followers help me with from time to time. There have certainly been some great names created with a "K". How about Kwitcherbitchin, Kraps, Kosmic Kaos, Kookaburra or Kartwheels. "Why do I create what I do? This is simple...I just love the feeling of accomplishment! The chatter or the sometimes ribbon or the heart warming feeling that is bestowed when given. I feel overwhelming comfort just walking into my sewing room every morning. Wondering how much time I can spend enjoying my craft each day. Hoping it's hours of uninterrupted time. I wish everyone can enjoy their hobby as much as I do. It is true that "my soul is fed with needle and thread". "How does my creating process work? 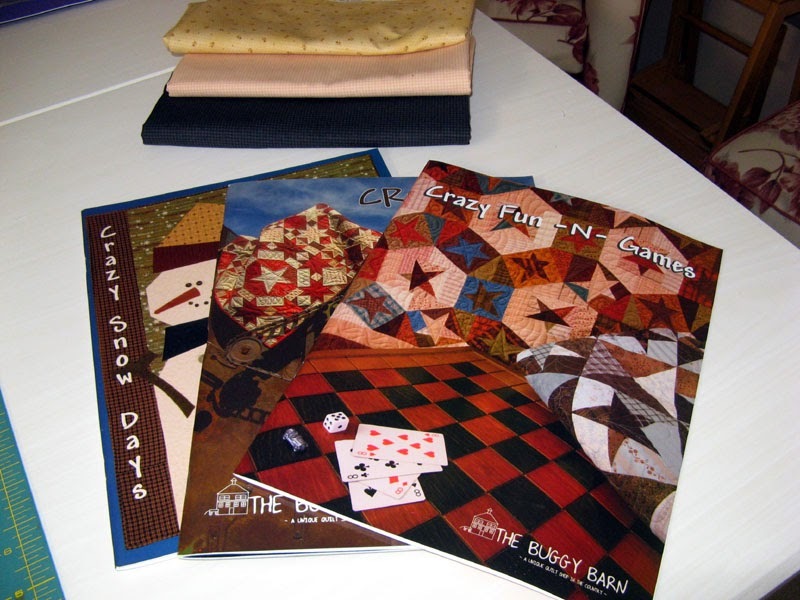 It doesn't take much more than a publication of a design...certainly among my most popular choices in designs come from Bonnie Hunter, Judy Niemeyer, or the most recently dissolved Buggy Barn. Then of course there is the very strongest of desires to use up my fabric stash. I've heard it said I'm great with color. This of course takes time sifting through my stash with each pattern. 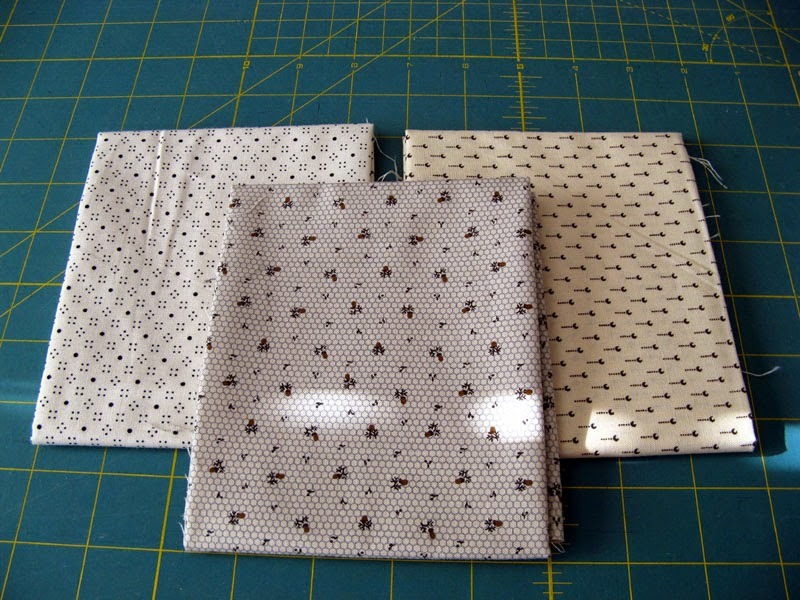 I've got my next three Bonnie Hunter, one Judy Niemeyer, and two Buggy Barn designs ready to sew...just need to finish what is started before moving into these. I have trouble working on too many projects at once. So in closing here are a few of my blogger friends. Hope they have something that tempts you to read more from them in days ahead. Enjoy the Blogosphere! Friday I stopped by Beverly's to pick up two copies of the San Diego Quilt Show program. My friend Mary was kind enough to help getting them. I didn't have a chance to attend the show this year. 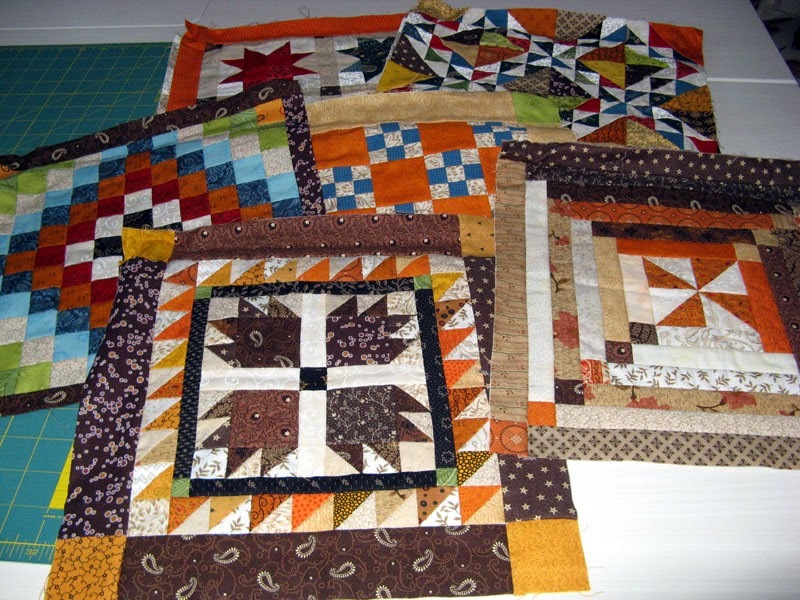 I did have eight quilts entered so having the program was important to me. While at Beverly's I stumbled on these three FQ neutrals. Hard to resist them coming home with me along with the programs. Thanks Mary for the opportunity for both! I finished my September UFO so I've been spending time on Zuckerwatte. At the top of the photo you can see the blocks I'll be creating. Everything is cut to make them as well as the string blocks that are at two of the corners. The triming does take some extra time, but it is worth the effort in my opinion. 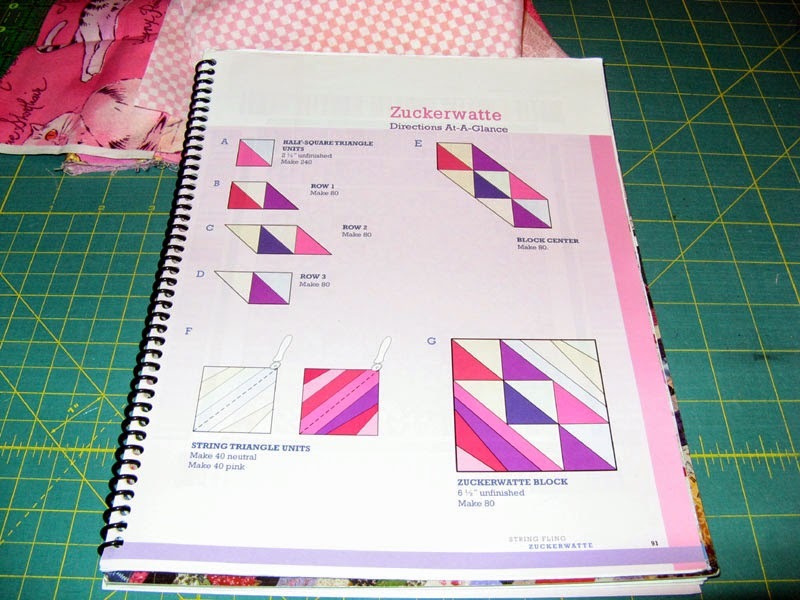 I'm also clearing out pinks and light purples from my stash with this design by Bonnie Hunter. Might need to rob from Kerry's and my Mom's stash for the string border...we'll see how that goes. So back to my stash report for this week. Neutrals are always a good thing to add to your stash, so I don't feel too bad with this week's enhancement. Hope you are achieving in the right direction. 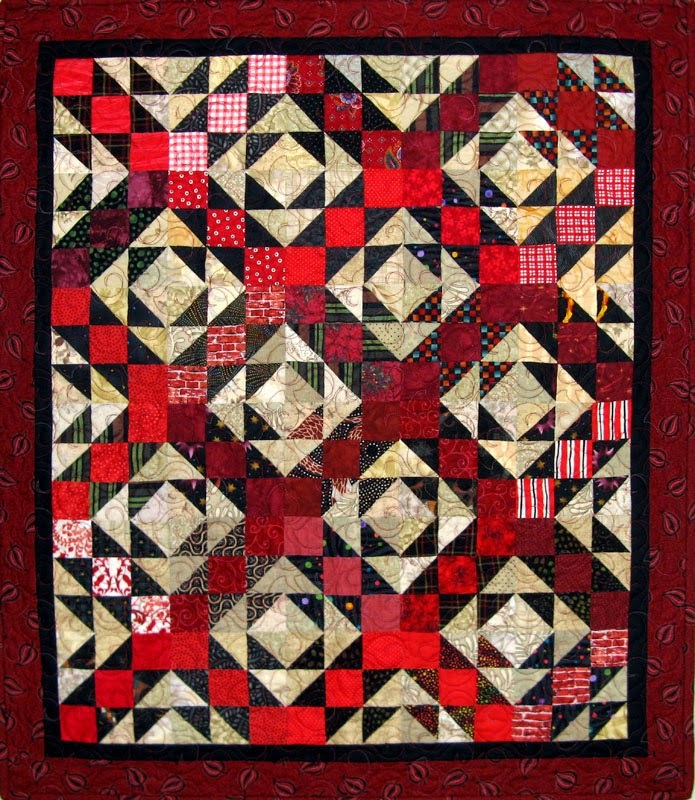 See more reports though the links at Judy's Patchwork Times blog. Oh, I did finish a few projects, but already counted the yardage. Check them out on my website at www.kwiltnkats.com. Enjoy your Sunday. 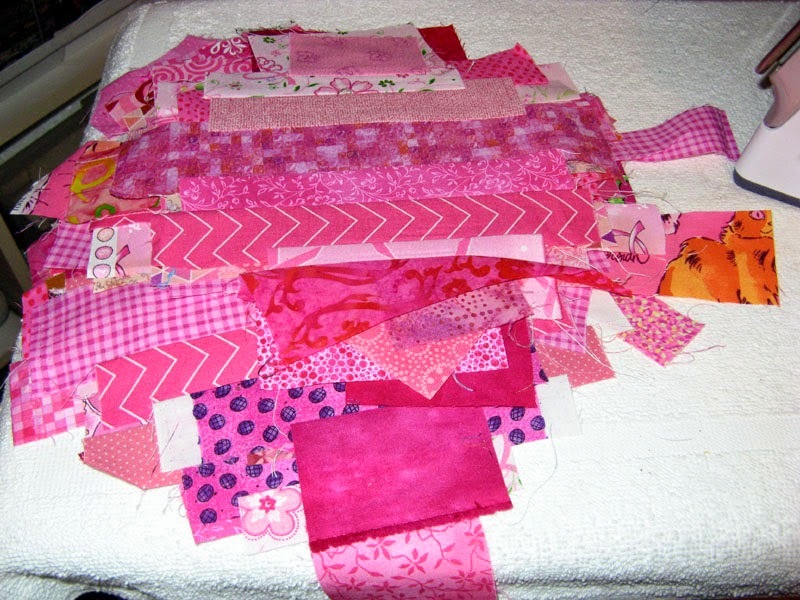 I have cut out the 12 1/2" squares that will be assembled for the back of Kadence. I used all the fabrics I could find that were patriotic and added a couple of geometrics to give me the needed width and length. I will be putting these together later tonight. My Mom gave me a lot of strips while I was in Maryland, so combined with mine I have lots of variety. Definitely the more variety the more interesting the string blocks become. There are still a bunch more to make, but I made a good dent in the required 40. Now it is time to square these up to 4 7/8"! I hope you have an excellent week. 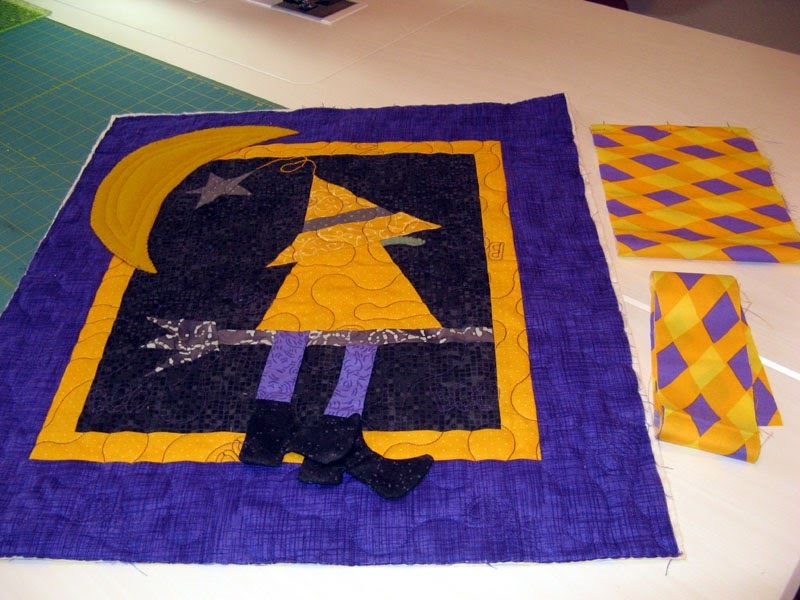 Check out other projects from quilters around the globe through the links at Patchwork Times. Saturday I purchased a bit of fabric from Beveryly's in Kearny Mesa. 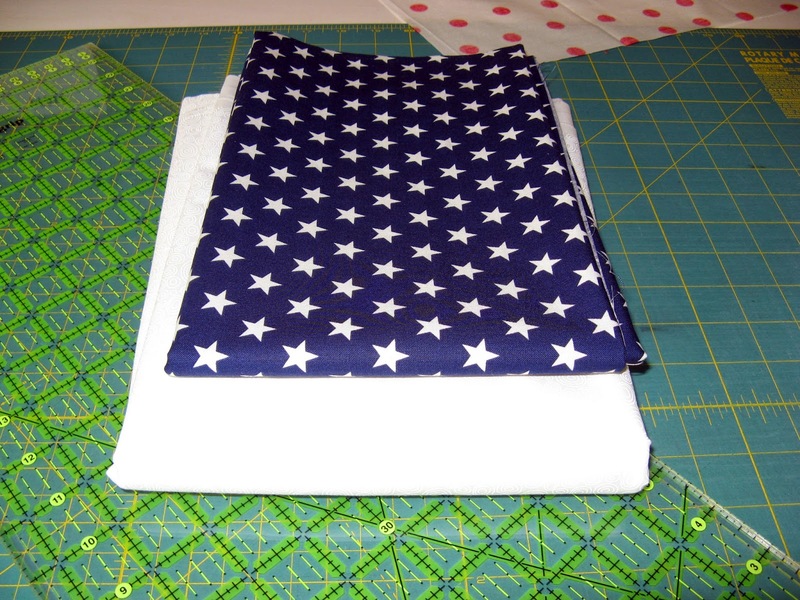 The star fabric as you can see below became the outer border for Kadence which is my September 2014 UFO. I'm happy to have it done so I can get back to my Buggy Barn project Krazy Kookoos. This is the back I've assembled. 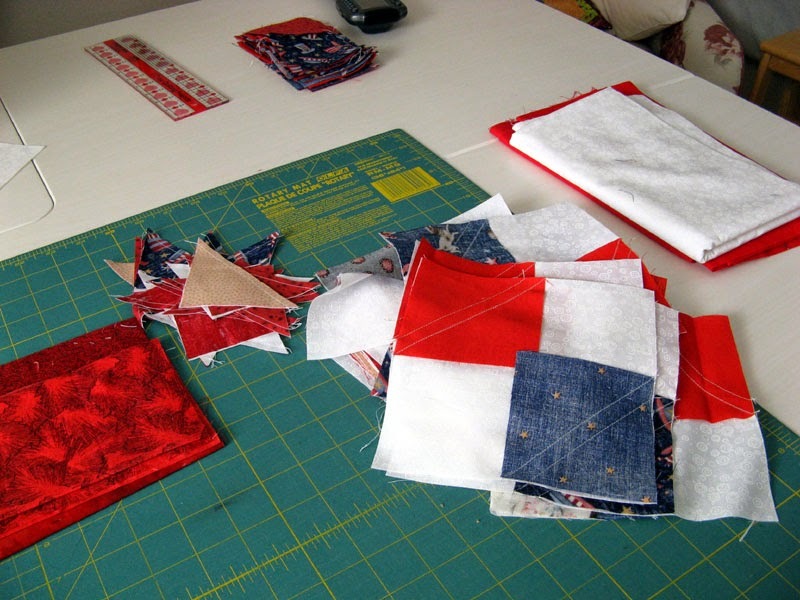 I took every possible patriotic fabric from my stash to create 12 1/2" unfinished squares. 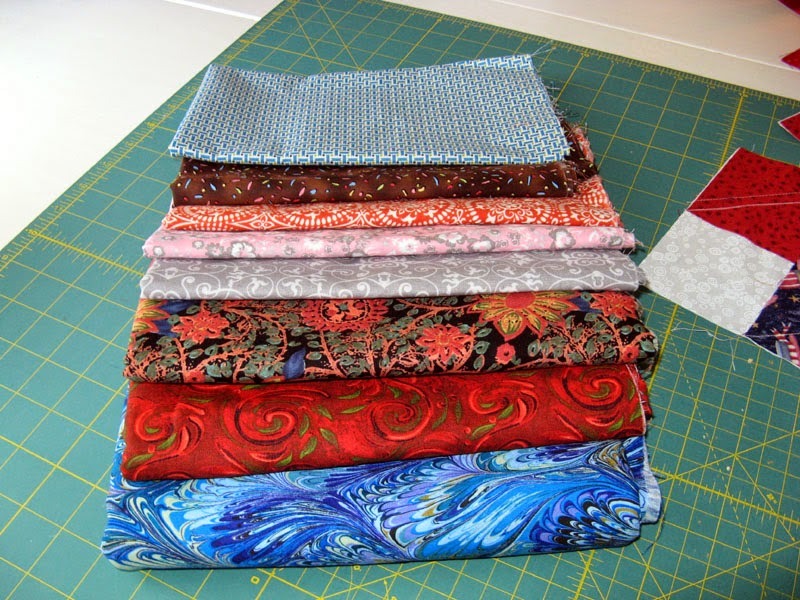 I'll sew them all together for an entirely (except the outer border) stash buster project. Kadence is a design FREE from Bonnie Hunter on her website called Fourth of July should you be interested in making one for yourself. 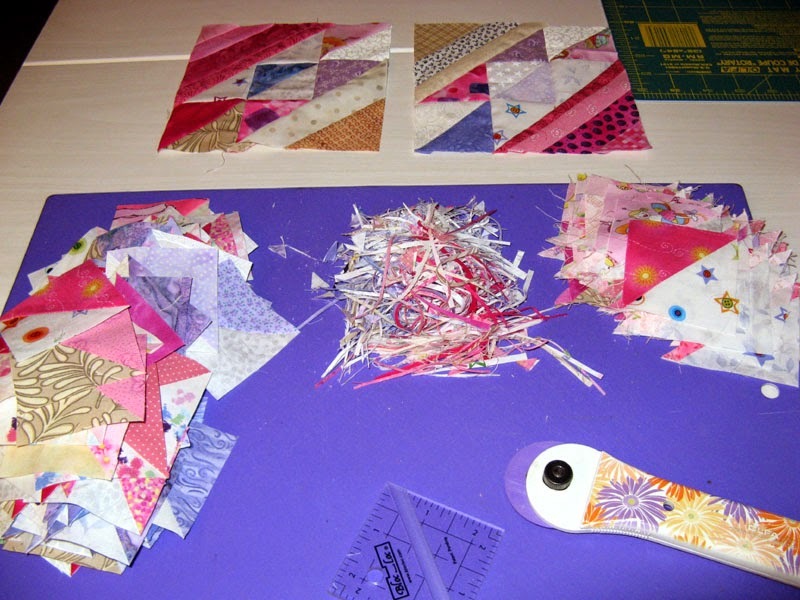 I think I'd be pleased to use up some more of my bonus HSTs on a version using 2" pieces rather than 2 1/2" pieces. I really like the finished size of Kings where I did just that. Kings is also a design FREE from Bonnie Hunter on her website called Playing With Jacks. So this Sunday's Stash report I have a bit to claim used and purchased. I'm not making too much headway into my stash this year, but I'm still not adding too it! A good thing. 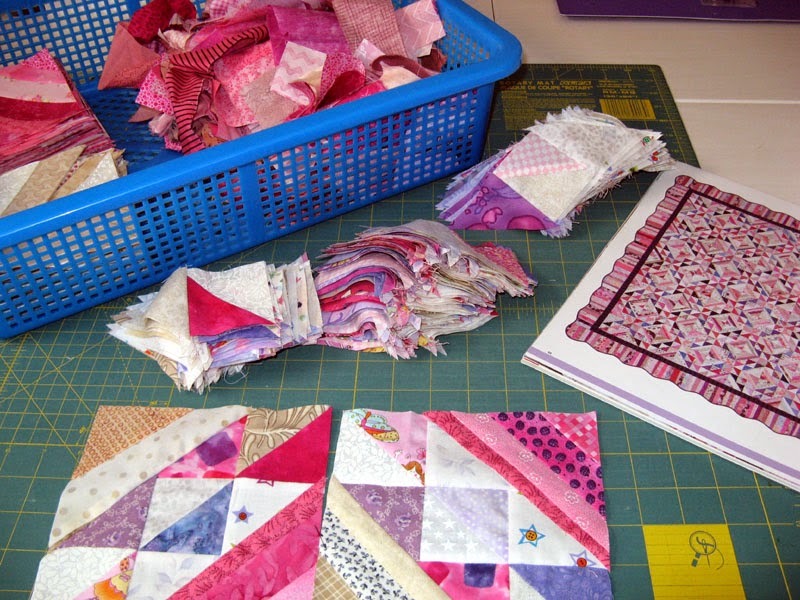 See other quilters using their stash in ways different than me through the links at Patchwork Times. This is the hand sewing that kept me busy on my flight out to my parents home in Maryland. It sure is a long flight from California. Having my hands busy sure makes the time go by faster. Krazy Kattle 2 is above. The cows were left from the original project. The barn finished off my desired layout. 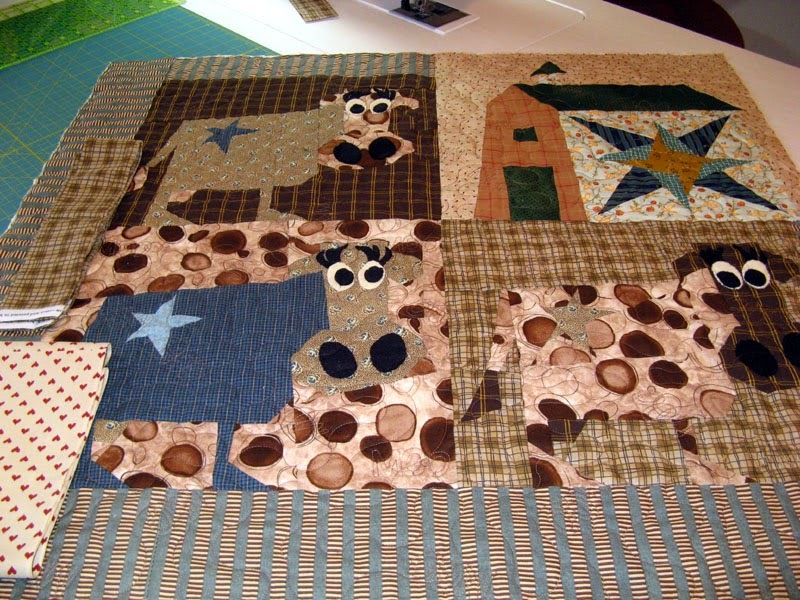 I sewed down the eyes, lashes, and nostrils on the three cows. Krazy Kookoos is about half finished. This is the original project. 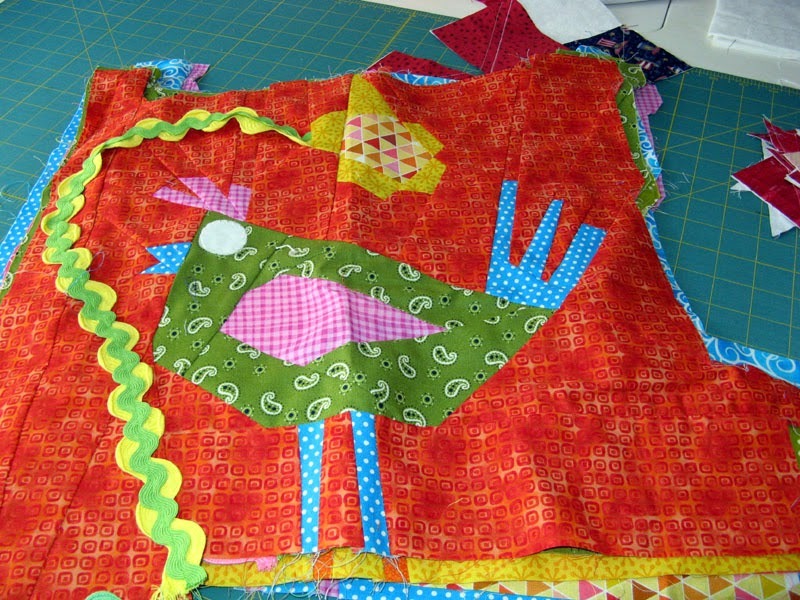 All ten birds had their eyes sewn in place. After the quilting a button will go in the center of the white wool. There will be three birds left that I'll create a secondary project with. 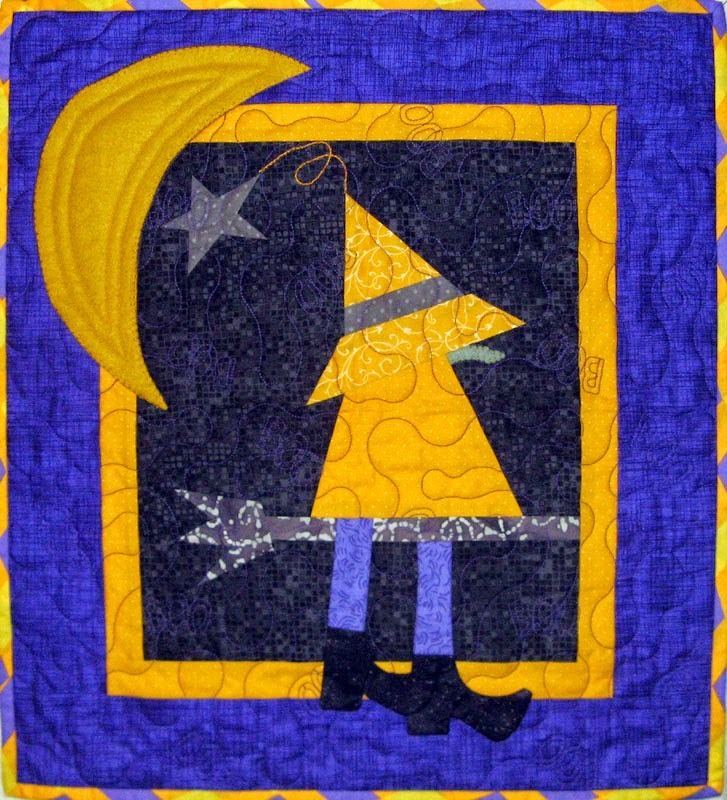 Lastly Krazy Krones 2 had the moon, nose, and the star movement from the hat stitched. This block was the only one left from its original project. 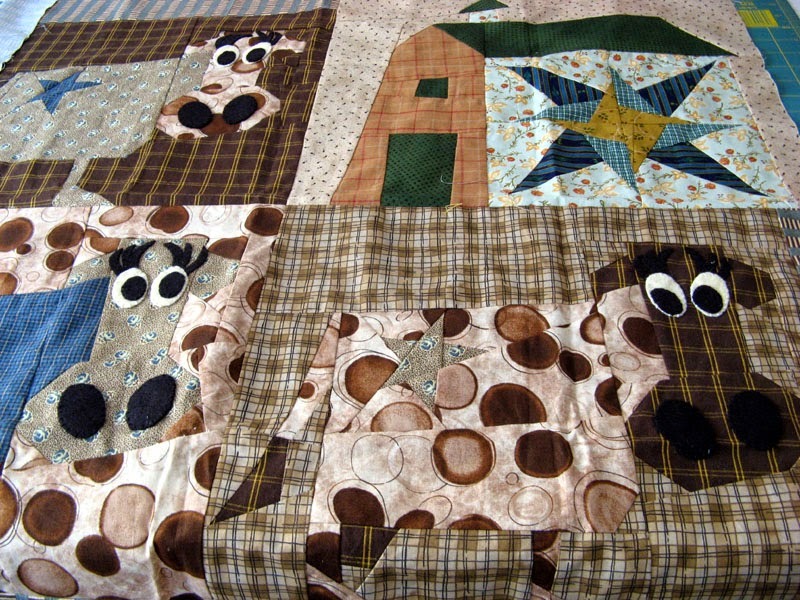 Sadly, Buggy Barn Quilts is closing their doors. I'm so bummed about this. They have a sale going on of their remaining inventory; 20 percent off discounts started last Thursday. I grabbed three pattern books and a few 1 yard pieces of fabric. I posted two of my newest finishes on my website www.kwiltnkats.com. 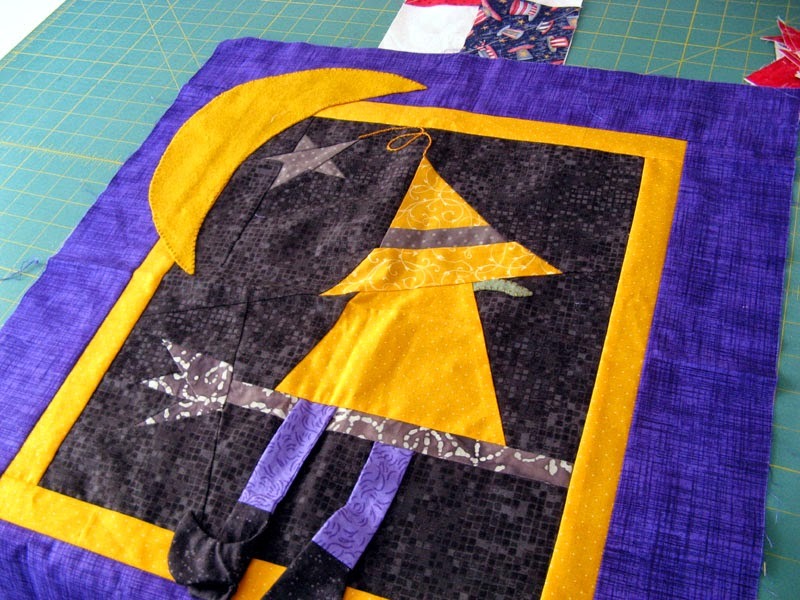 If you have time check out Krackerjack and Krossfire under the Personal Quilts tab. Both of these along with six others were just displayed at the San Diego Quilt Show this past weekend. Kerry has some quilts for me! I'll see her tonight at the first of the membership year meeting of Sunshine Quilters. I'll be sharing Kootenay Kabins and Kings soon. I'm busy working on my September UFO, Kadence. 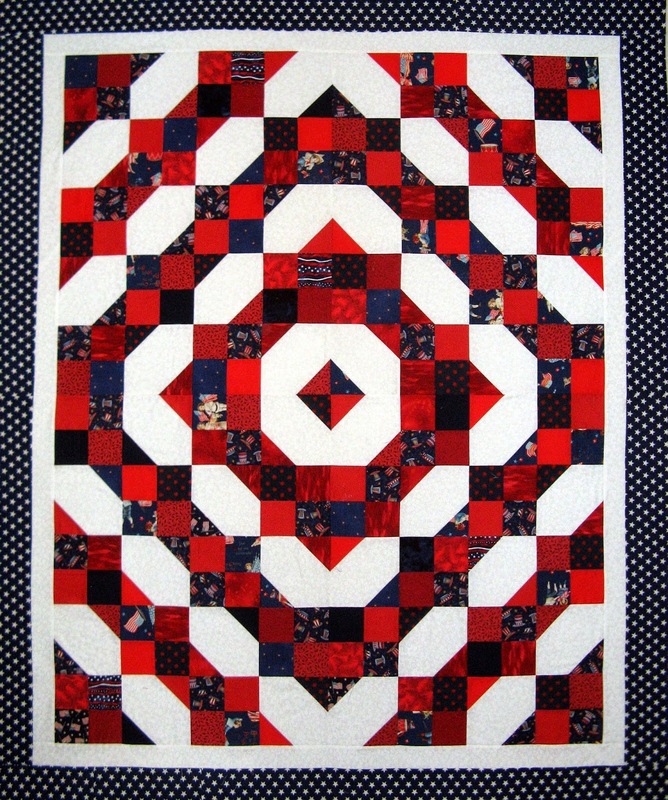 This is a Bonnie Hunter design called The Fourth of July. 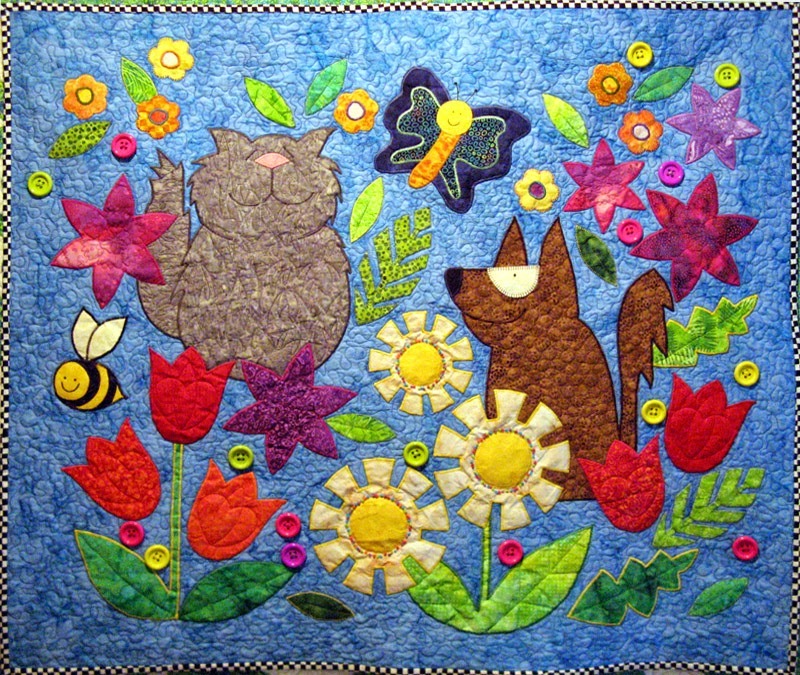 Free on her www.quiltville.com website. I'm a little be further along that what is up on my design wall. I've run out of a patriotic blue and darn I didn't think to look through Mom's stash before I left Maryland. Oh well, always nice to visit one of our local quilt shops! I hear the San Diego Quilt Show was nice this year. Thanks to my friend Kerry for dropping off and picking up my eight quilts. It sure will be tough at work today after being off since August 28th... Enjoy more projects through the links at www.patchworktimes.com. It has been a little bit since I've posted. I spent a little over a week with my parents. We were so busy and not with sewing! There were a couple of purchases but most of what I came home with was a gift from my sister. What you see above is a collection of Karen's choosing. No particular reason other than it caught her eye and knowing my love of fabrics... They range in size from 1/4 yard to 2 yard cuts. I'm sure something will come along to use them. These are the only purchases. Five FQs with Buggy Barn designs in mind for the red and can't we always use a neutral or two or three? 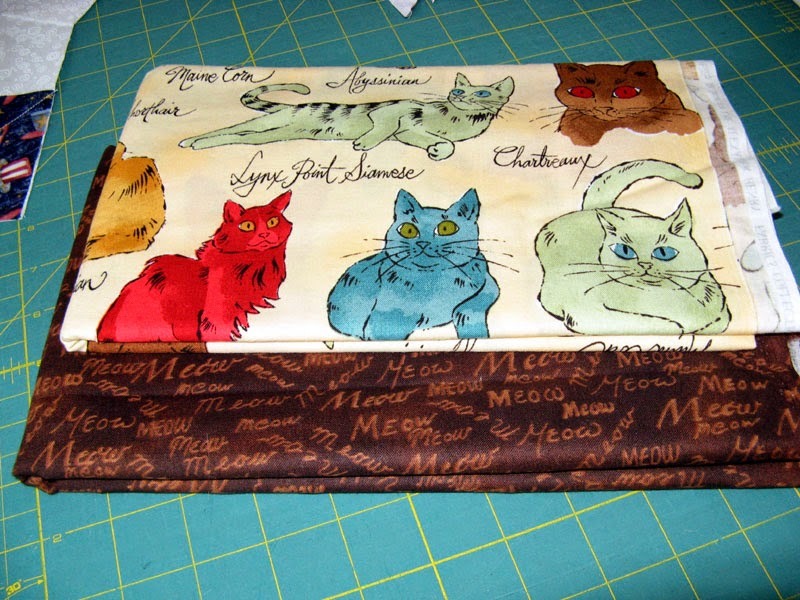 The last two feline fabrics were from a stash reduction from a member of one of my Mom's quilt guilds. I had a chance to attend one of them and these fabrics had to come home with me. Nothing to change the used category and since I didn't purchase most of this fabric I'm only going to add in the five FQs.